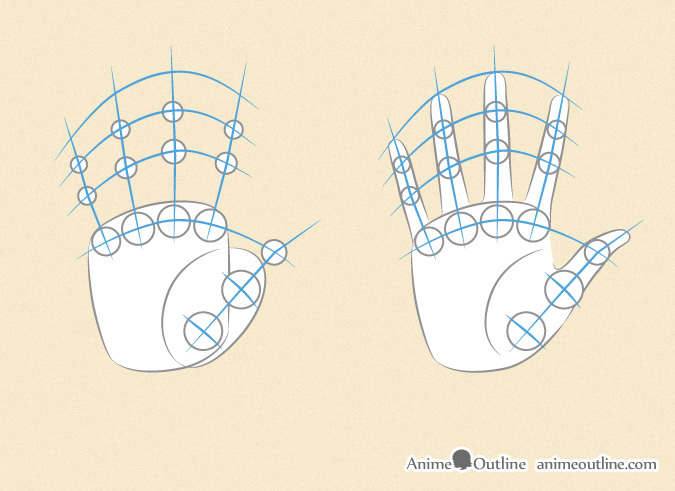 This tutorial illustrates how to draw anime and manga hands in various positions. 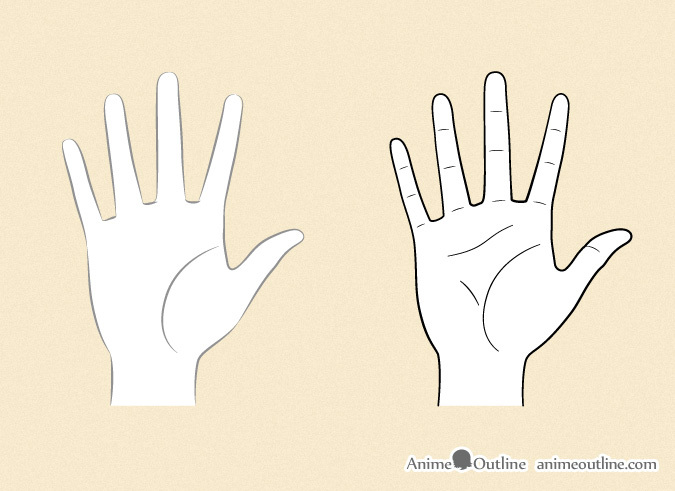 While It’s difficult to have one clear guideline for how to draw hands as they can bend in so many different ways this tutorial provides some basic tips and examples. 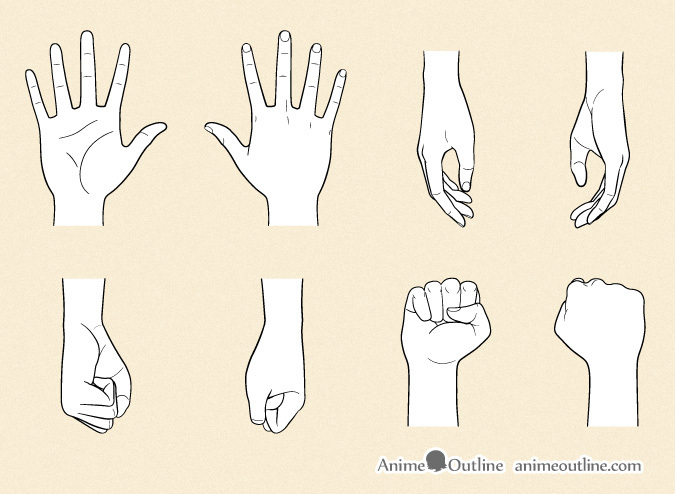 For anime hands holding different kinds objects you can see 6 Ways to Draw Anime Hands Holding Something. 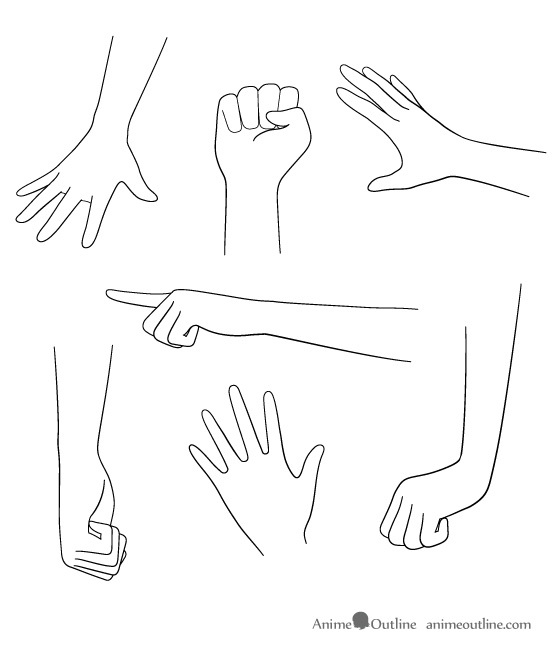 Hands a difficult body part to draw and the best way to learn is through a lot of practice. 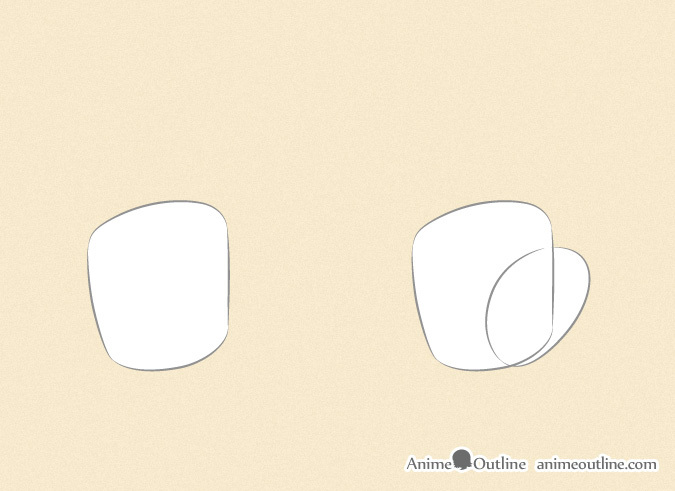 Drawing anime hands can be a little easier then drawing realistic hands as a lot of the details are left out. 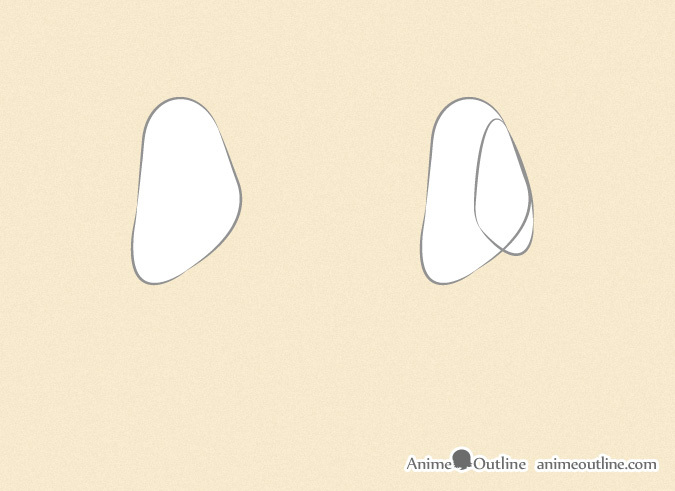 But the overall structure and proportions are basically the same. If you are a beginner then you should practice by first drawing the hand with the palm open and fingers extended to get an idea of the proportions. You can also look at photographs other drawings or at your own hands for reference. 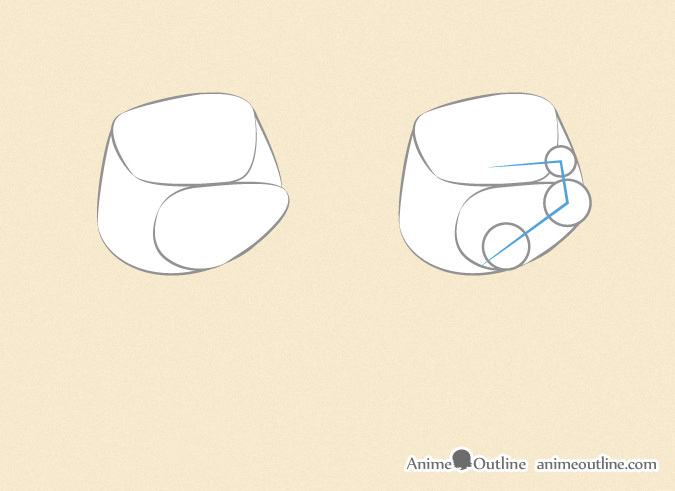 Draw a rough shape of the palm. Next draw a shape to get down the proportions of the base of the thumb. Study the proportions of the fingers. The fingers (fully extended) and the palm of the hand should be roughly the same length. The tip of the thumb if drawn at a 45 degree angle to the hand should reach to just slightly below the knuckle bone of the index finger. 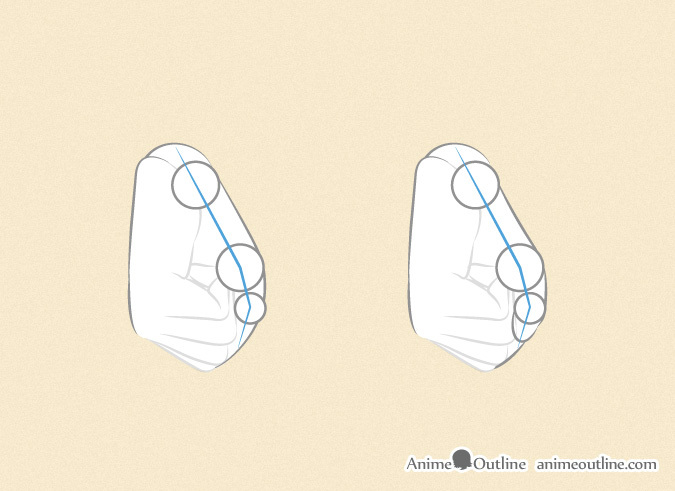 The fingers consist of 3 parts with the distance from the tip of the fingers to the top joint being the shortest and the distance from the knuckles to the bottom join being the longest. Draw the overall shape of the fingers and the thumb. Clean up the drawing and add the details. 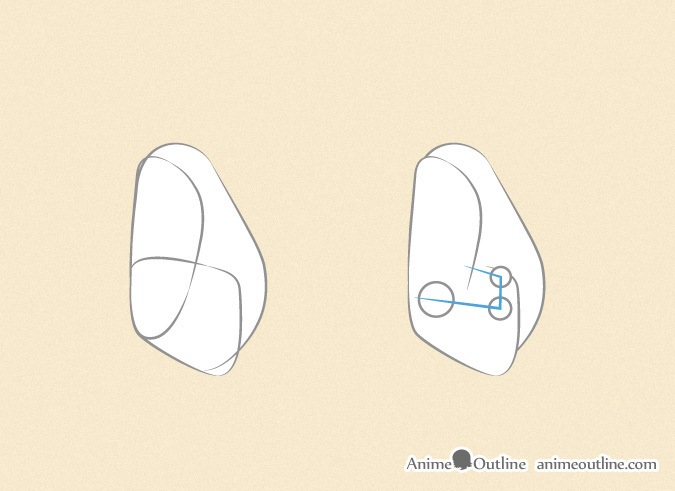 Draw a thicker line for the overall shape of the hand and a thinner for the details. This is a difficult view to draw but a very common position of the hand. 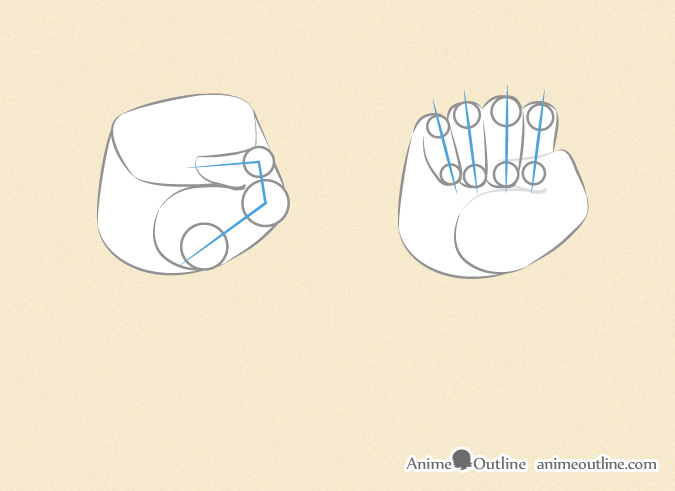 Draw the overall shape of the hand without the thumb or fingers and draw the shape of the base of the thumb after. 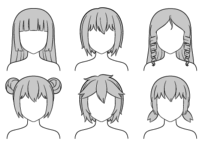 For the purpose of the tutorial I will fully draw out the structure of all the fingers (even the parts that wont be visible in the final drawing) for you to use as a reference. 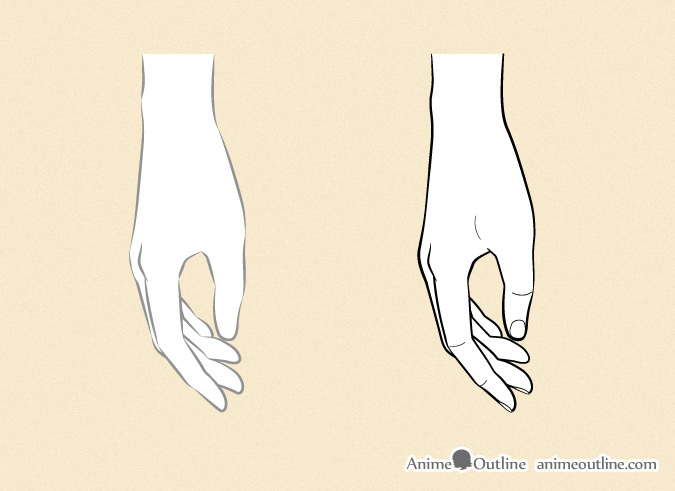 You do not need to do this (especially if you are drawing on paper) but you should be aware of the positioning of the invisible parts of the fingers to avoid mistakes when drawing that parts that are visible. 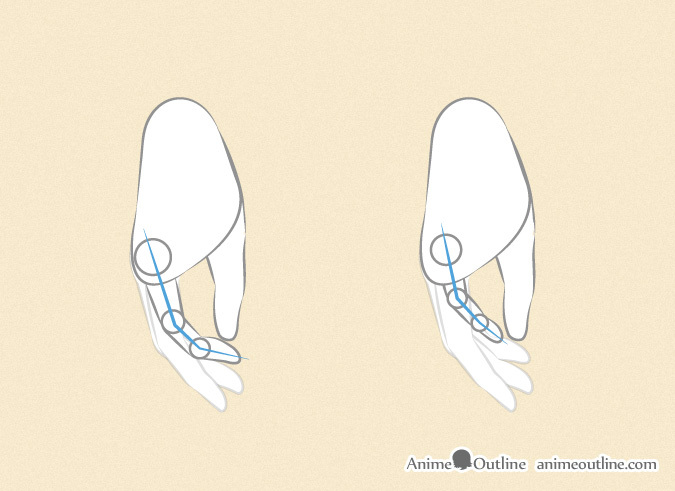 For example if you can only see the tip of the pinky but you don’t consider the length of the rest of the finger you can end up drawing the tip too far up or too far down the hand. 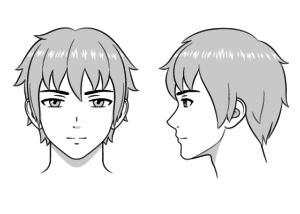 Clean up the drawing and add the details. This position of the hand would be used for something like holding a grocery bag. It’s close to a fist but not quite the same. 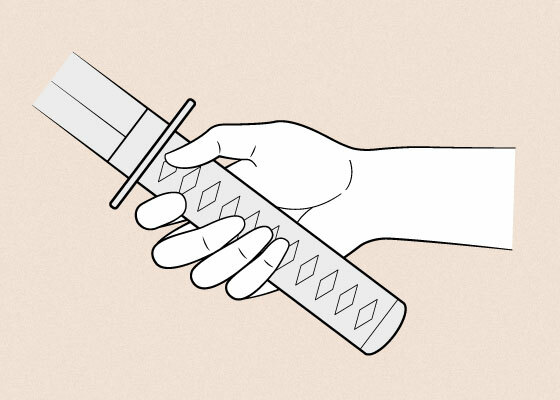 Draw the overall shape of the whole hand in this position. 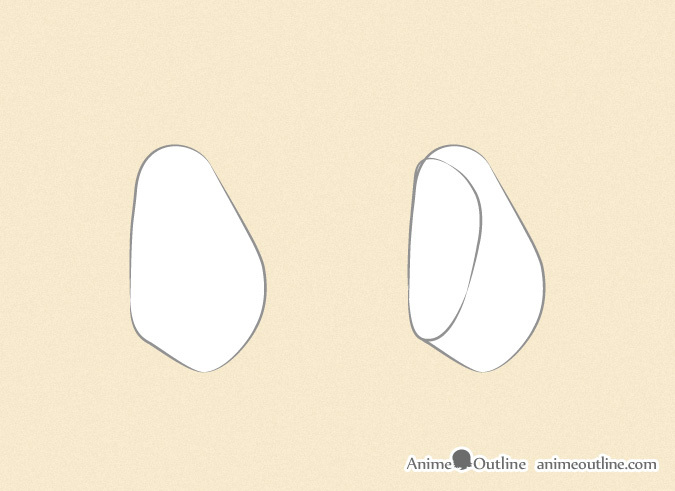 Next draw the shape of the side view of the palm. Draw the overall shape of the fingers and get the proportions for the pinky. 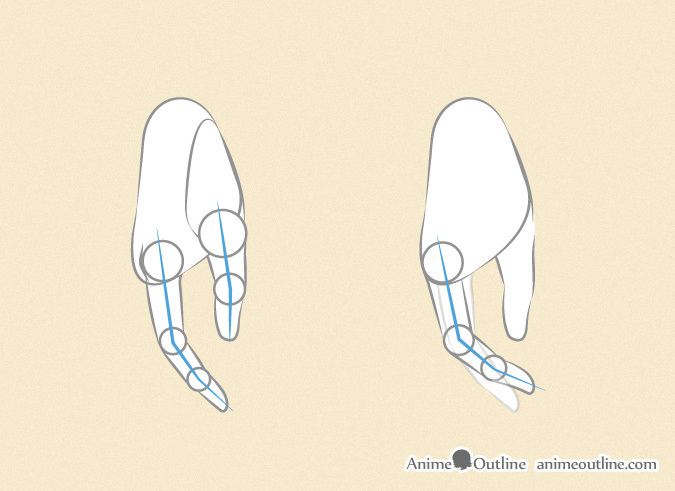 If you need a better understanding of how to draw the rest of the fingers (following the pink) in this view you can use the same method as in Steps 2 – 3 of the side view example. Get the proportions for and draw out the thumb. 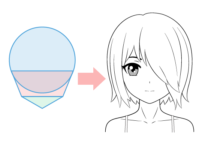 Clean up your drawing and add the details. 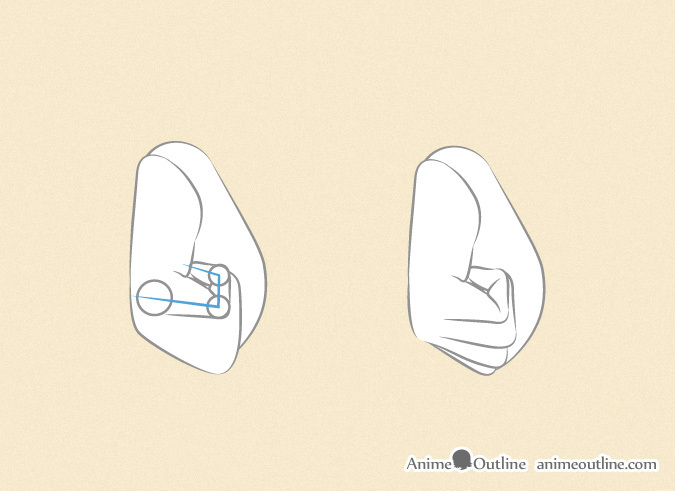 Draw a rough overall shape of the fist and afterwards draw the overall shape of the combined fingers. 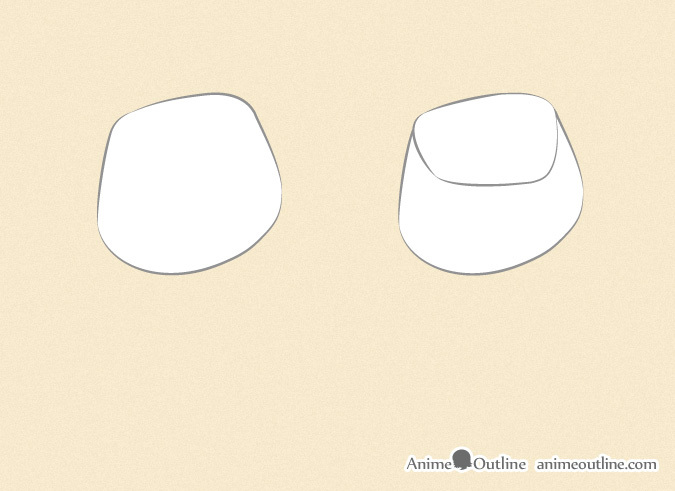 Draw the shape of the base of the thumb and get the proportions for the rest of it. Draw out the thumb. 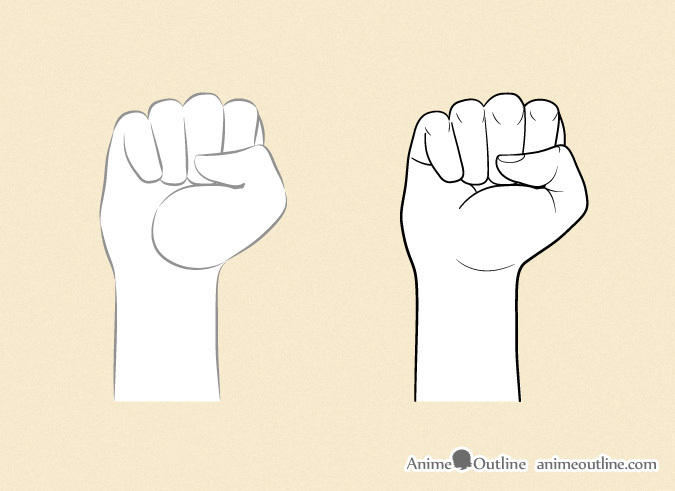 Draw the fingers slightly thicker than normal (squeezed) to show that the fist is clenched. Also be aware that in a clenched fist the fingers fan out slightly in a direction away from the base of the thumb. 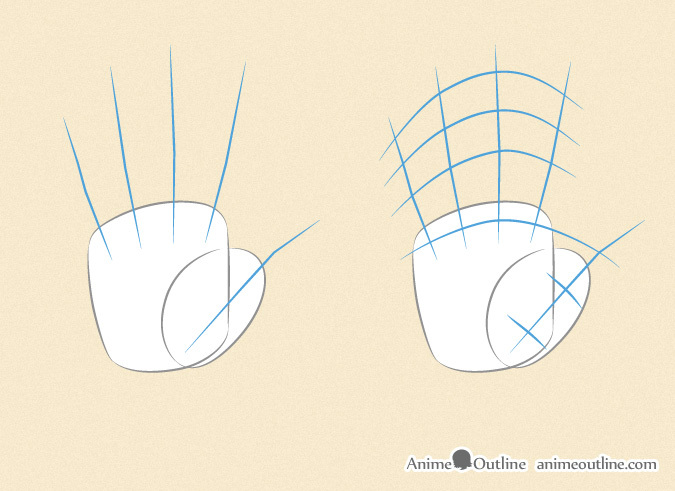 Anime male and female hands are often drawn in basically the same. However when drawing close ups of the hands there are a few differences. Female hands are usually more slender and curvy with long fingernails. 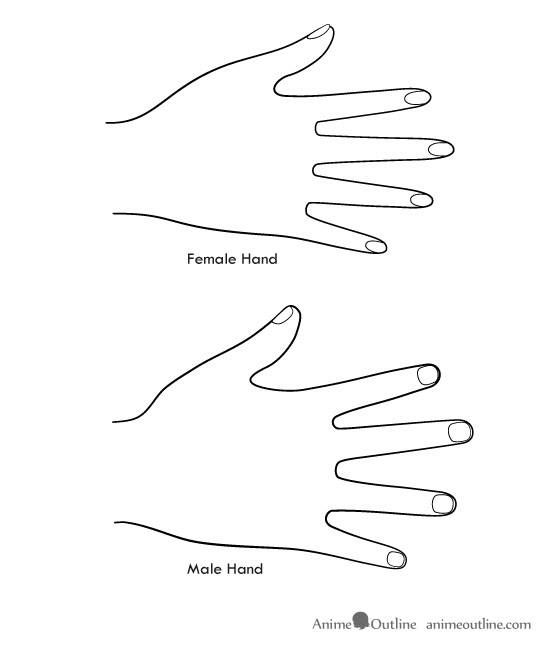 Male hands are usually bigger in comparison. 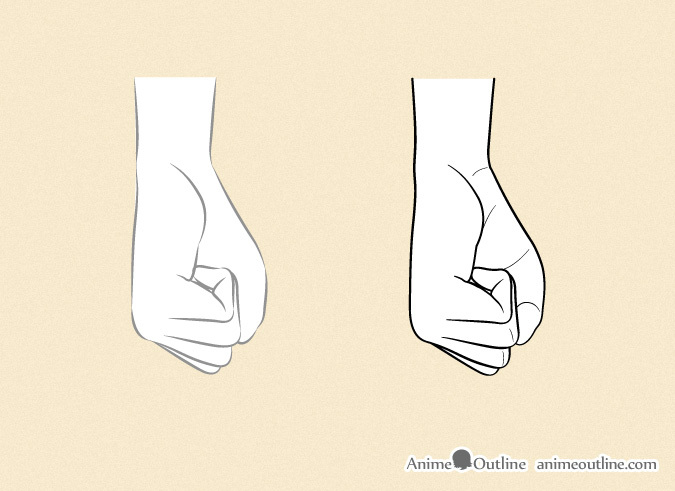 When drawing hands for something like a manga you don’t always need to make a detailed drawing. Sometimes a basic outline of the main feature of the hand is enough. For example if you are drawing a character that is in the background you don’t need to draw the fingernails on their hand. It takes a lot of practice to be able to draw properly structured hands in different views. Depending on your skill level as an artist your drawings may not come out the way you like at first but don’t get discouraged, hands are difficult to draw. 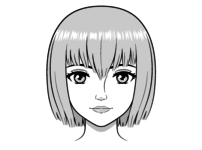 If you draw on a regular basis you can improve. 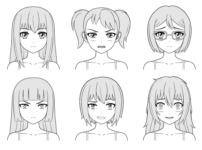 Hopefully you found this tutorial helpful as it was very time consuming to create. 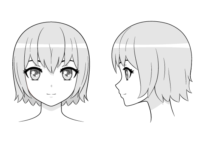 Don’t forget to check out some of the other Tutorial on the site.